RedVector is among the first continuing education providers with approved courses available on the new version of the Florida Building Code, which went into effect March 15, 2012. 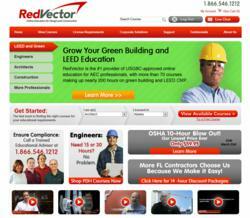 RedVector.com, the leader in online continuing education and training for the architecture, engineering and construction (AEC) industry, recently updated its online education library to reflect the most recent changes to the Florida Building Code (FBC). Two newly revised 1-hour courses include: Florida Building Code Advanced 2010: Residential Floors and Florida Building Code Advanced 2010: Fixtures, Faucets and Fixture Fittings. Florida contractors are required to complete one hour of an approved advanced building code course every two years. During the 1970s construction boom, statewide building codes were first mandated for the state of Florida, and in March 2002 the Florida Building Code was developed to create a uniform code to be enforced by all local governments. The code is periodically reviewed and updated, and the most recent version—which went into effect March15, 2012—reflects the 2010 changes. RedVector sets the standard for excellence in online continuing education and training for the design and construction industry and holds more than 60 state and national accreditations. Through our award-winning AEC Learning Management System (LMS) we offer individual courses as well as large-scale corporate training solutions for AEC firms featuring customizable and easily accessible online universities with a full range of tracking and reporting features. With an online library exceeding 1,100 courses authored by more than 100 subject matter experts, RedVector serves more than 130,000 AEC professionals in all 50 states. The recipient of numerous community honors and industry awards, RedVector was founded in 1999 and is headquartered in Tampa, Florida. For further information call 1-866-546-1212 or visit http://www.RedVector.com.